Many YouTube video creators are not aware that you can boost your video views in YouTube through simple video marketing tactics found in the Google AdWords platform. Access to this video advertising feature is not prominent to those looking to get more eyeballs on their content and this article will help you discover how best to use YouTube Advertising. With Google AdWords you can create video ad campaigns to market your videos on YouTube, Google Search, Google partner sites and apps that are part of the Google Display Network. There are over 178,000 websites that are using Google Custom Search and all are considered partners and there are millions of publishers that are in the Display Network. These videos below will help to understand what the display network and partner network are all about. The partner sites and display network will expose your ads to a much larger audience but it is hard to control the geography of where your ads appear. It will also dramatically increase your advertising spend. If you are just starting out and focused on local customers, I recommend just focusing on YouTube and Google Search for your initial campaigns. TrueView ads can be very effective and can be highly targeted to the audience you are trying to reach. It is called TrueView because you only have to pay for the ad impressions if the viewer has actually watched or interacted with your video. Those not really interested in your content will just skip the ad when they are prompted or choose not to click on the ad when presented a discovery ad. TrueView in-stream ads – This type is probably the most well-known. TrueView in-stream ads play before, during, or after other videos and get displayed on YouTube as well as apps and partner sites. The viewer can skip the ad after watching it for at least 5 seconds. TrueView video discovery ads – TrueView video discovery ads are placed next to related videos in the YouTube search results and the YouTube mobile homepage. These first two are text based ads that can be created with minimal creative investment using the AdWords dashboard. 3. In the summer of 2016, YouTube introduced Bumper Ads to reach smartphone users more effectively. Bumper ads are very different from TrueView Ads. This short teaser video plays before, during, or after another video and can’t be skipped. Bumper ads only have a maximum length of 6 seconds. Bumper ads get displayed on YouTube plus partner sites and are a great way to increase the awareness for your brand. One thing you should keep in mind is that for Bumper ads, you pay based on impressions rather than engagement. These types of ads will require some creativity, content development and video production skills that most small business owners don’t have themselves and you may need to contact a local YouTube video marketing service to assist with these Bumper ads. AdWords allows you to set up and manage video campaigns with ease. All you need to do is to begin adding one or more videos to your YouTube account and then you can start creating a campaign in your YouTube Advertising dashboard, which includes defining your target audience, establishing your budget, and setting up an ad schedule. AdWords makes it very easy to create basic TrueView text ads although we recommend you consider the ad creative very carefully. It is important you put yourself in the mindset of a future client and attract them with the words you are choosing. operating system, device model, etc. In terms of budget, you always have full control over the amount you are willing to spend. You can decide between setting a daily budget or a total campaign budget. If you choose the latter, you also have to set an end date for your campaign. TrueView ads often default to $0.04/click which is a bargain compared to other forms of online marketing tactics. 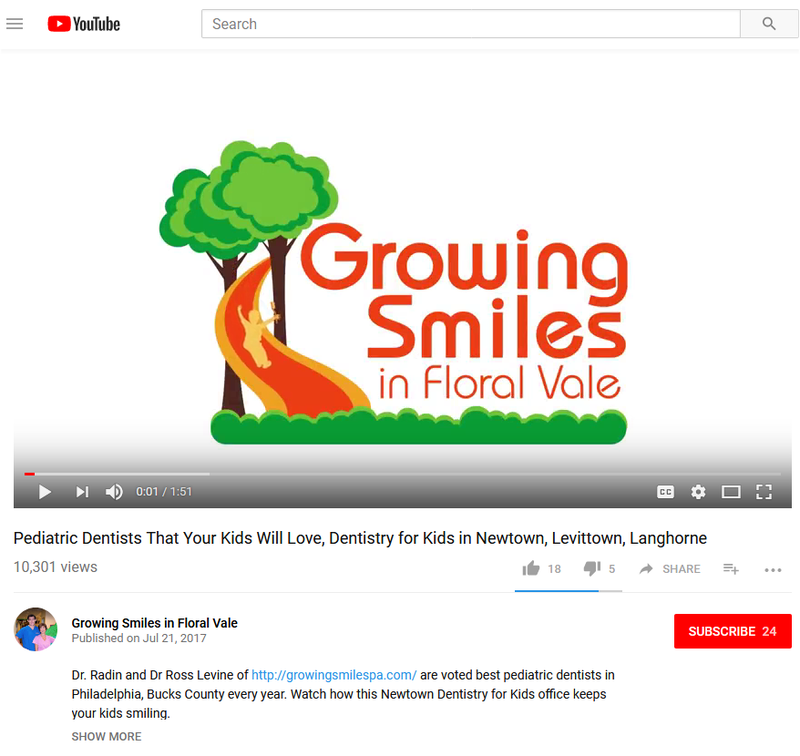 Here is a real-life example for a local pediatric dentist in Bucks County that is interested in attracting moms of young children within a 15 mile radius of their offices in Yardley. Before I began using TrueView Ads in YouTube for this video, there were only 20 or so views. The first thing I did was to apply some video SEO techniques that will help get more organic traffic in YouTube. That includes Keyword research and engineering video Titles, Descriptions and tags. We are now averaging 4800 views per month for this video and that costs under $100.00. The audience is composed of 90% female, ages 24- 36 and all within 7 zip codes close to the office. The client is thrilled with the activity and positive reaction of new parents that found them on YouTube.